The past few days have been oddly warm for February. With temperatures in the 60s and peepers singing at night it’s easy to forget that it’s not quite spring yet. Don’t let that stop you from foraging though! 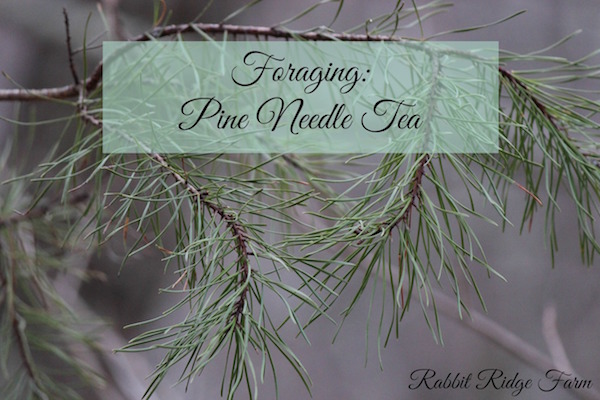 One of my favorite wild food recipes that can be made year round is pine needle tea. Pine needle tea is a great winter beverage because it’s loaded with vitamin C. Great for scurvy! Just kidding hopefully no one is suffering from that today. It’s also great because pine is easy to identify for the beginning forager and readily accessible in most forested areas of the U.S. There are several different pine species you can use for this but I have only personally used Eastern White Pine (Pinus strobus) and Virginia Pine (Pinus virginiana). The one pictured is Virginia Pine. Both Virginia and White Pine are found in large parts of the Eastern United States and are easily identified. The Virginia Pine’s needles are in bundles of two and are 1 1/2 to 3 inches long and slightly twisted. 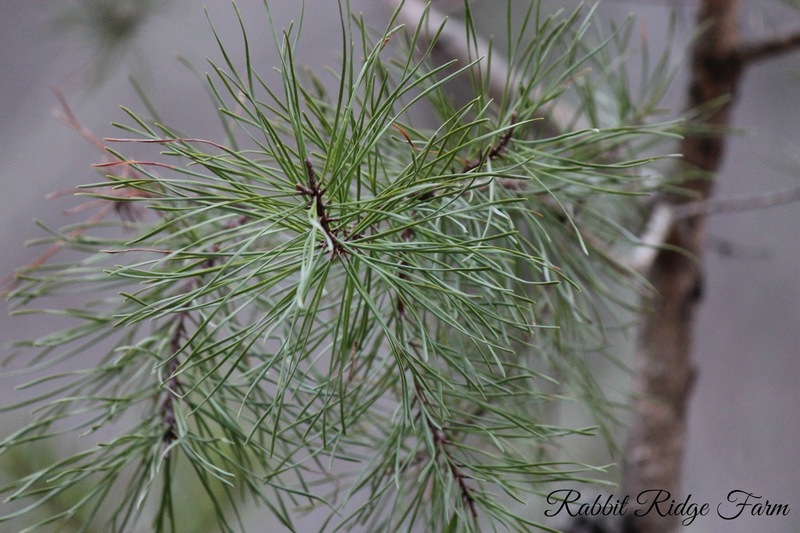 The White Pine’s needles are in bundles of five. They are long (2 1/2 to 5 inches) and slender. 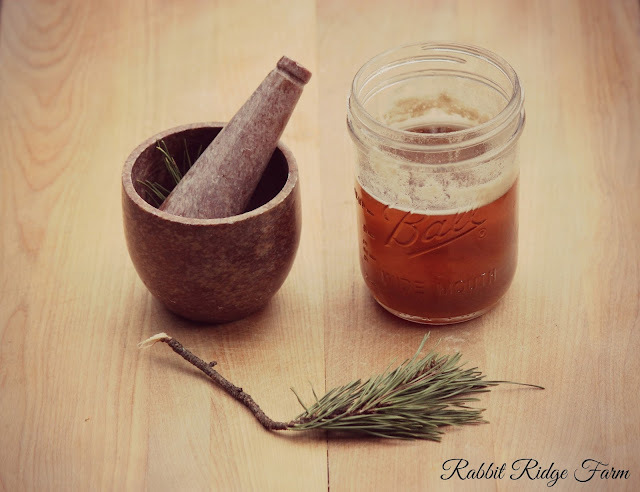 Many other pines may be used for needle tea but with any of these make sure you are positive about your identification as there are trees that may look safe but are actually toxic such as the Ponderosa Pine. My favorite book for trees is Field Guide to Trees: Eastern Region by the National Audubon Society. I love this book because it has nice glossy pictures along with great information and range maps. A book like this or an experienced forager can help you to be safe in your tea time adventure. To make the tea I use a bundle of needles with a circumference about the size of a quarter. I separate the needles from any woody parts and cut them in half. I then press them a bit with a mortar and pestle. If you don’t want it to be as strong you can use whole needles. I add the needles to a cup of water and then bring the water to a boil before serving. I like to drink mine with a bit of our homemade maple syrup as it can be strong on its own. Have fun foraging, be careful, and get outside and enjoy the rest of winter! This post has been linked to the Simple Saturday’s Blog Hop. I am in no way an expert on foraging. Please do your own research before consuming any wild foods. This post contains affiliate links. If you purchase something I will receive a tiny percentage at no extra cost to you. I would not recommend products I don’t truly love so please check em’ and keep this blogger afloat! One Response to "Foraging: Pine Needle Tea"